Picking the right analytics tool for your website can be a difficult, time-consuming and expensive business. Do you go for the cheap or even free services such as Google Analytics or do you decide that you need the additional reporting and flexibility that an enterprise class analytics tool like Omniture can provide? The problem is often that when it comes to price or services, there isn’t much in the way of a middle ground between the cheap or free services and the services that can cost you tens (or hundreds) of thousands of dollars. In the end, many companies find themselves gritting their teeth and paying huge sums for analytics tools. The most important thing to remember when making a decision is that while choosing the right tool is important, of far greater importance are the people who will be deriving the key insights from the tools. A very common scenario is for websites to spend huge sums on top of the range analytics only to have them create a multitude of reports and statistics that they do not have the resources to truly understand. Such websites would almost certainly be better served by going with a cheaper more limited analytics option that they do have the resources to gain insight from. Analytics guru Avinash Kaushik has identified a useful rule of thumb for companies looking to make a decision about what analytics tools to acquire. It’s called the 10/90 rule of analytics and it states that for every $10 you spend on analytics you should be spending $90 on the people to analyse those reports. This means that if you’re a company spending $50k on an Omniture or Core Metrics implementation then you should be spending $450k on a team to analyze those results. That’s a team of four-to-five top quality analysts working full time to analyze the reports, create tests and really make use of the service. If you don’t have the budget to spend $500k on a full-fledged analytics team, it’s a good idea to delve into what you can actually do at the other end of the market. With a little creativity, you can replicate a lot of the key functionality of the big services for very little, while getting a more focused approach that suits the resources you can bring to bear. Google now has a beta tool that allows you to do advanced segmentation. You can create and track a wide variety of segments with multiple layers. For example, I could track how long new Mac-using visitors are spending on their personal chartbeat dashboard page versus returning users. It takes some time to get used to all the options that are available, but there are certainly enough to compete with many of the reports you would be relying on from enterprise vendors. Chrix Finne recently posted on a way to use Advanced Segmentation to track iphone users visiting your site. In fact you can even use the advanced segmentation to hack your way around the limits on…. It’s true that each profile in Google Analytics only allows you to create and track four goals. However, you can get round this in a number of ways. One way is to use the advanced segment tool to create multiple segments each focusing on a particular page in the goal conversion process. From there it’s a simple excel calculation to work out as many goals as you like. However, my preferred method is much simpler and merely involves creating a second profile for the same domain. If you go to your Analytics account settings, you can add a Profile to an existing domain. It doesn’t require adding any extra code and you can then track another four goals for every profile you add. The Enterprise vendors are right that Google can’t show you real-time analytics or give you alerts when something is happening that you need to know about. However, adding Chartbeat to Google Analytics puts you back in the game. Chartbeat’s real-time analytics can show you what’s happening as it happens and its Email and SMS alerts are customizable so that if you want to track the traffic, or page load of a particular page then you can enable that quickly and easily. By truly exploring the potential of Google Analytics combined with Chartbeat, companies can adhere to the 10/90 rule and save themselves an awful lot of cash. Baratunde Thurston, the awesome web editor of the Onion and the always insightful Jack And Jill Politics, gave an interview to Jolie O’Dell of Read/Write Web. Baratunde covers the problem of content curation online when dealing with an exponentially increasing amount of content and then moves on to the real-time web and what he loves about chartbeat. The video isn’t embeddable so go here to read the interview and watch Baratunde in action. The Twitter fail whale made it famous but someone hitting your 404 page has long been an early indicator of a potential major problem with a site. You can do a useful hack with chartbeat alerts to make sure you are instantly aware of anyone arriving at your 404 page instead of their intended destination. 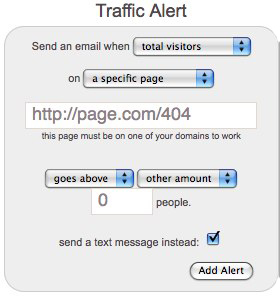 Send an email when total visitors on a specific page (type in the address of your 404 page) goes above 0 people. Then choose if you wish to receive the alert by email or SMS and press ‘Add Alert’. That’s it! Now you’ll always be instantly aware of anyone hitting your 404 page.